Corporations and agencies outsource most of their copywriting and need copywriters more than ever today — including for Internet marketing. Most copywriters cannot keep up with the demand for their services, and many make between $50,000 and $150,000. Corporations and agencies outsource most of their copywriting and need copywriters more than ever today — including for Internet marketing. Most copywriters cannot keep up with the demand for their services, and many make between $50,000 and $150,000. Start & Run a Copywriting Business is your essential guide to getting started and prospering in an industry that offers substantial income, flexible hours, and stimulating work. This book will provide new copywriters and old pros alike with proven, step-by-step strategies on how to find and keep clients, complete common copywriting tasks, set up an effective office, and overcome the unique challenges inherent in this business. Turn your talent into dollars by learning to write ads, brochures, direct mail, websites, and business-to-business and e-mail marketing materials. 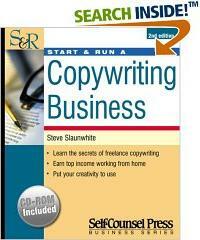 Start & Run a Copywriting Business will show you how to write copy your clients will love. The worksheets and checklists on the CD-Rom are included in MS Word and PDF formats for use on your Windows-based PC. "Copywriting can differ from business writing in its use of grammar. It's been called the rebel son of business writing - and traditional English composition in general. Copywriters will unabashedly use colloquilisms, cliches, contractions, repition, underlining, and italics to get their point across. Ads and brochures may be riddled with sentences starting with And, But, or Or. Sentence fragments are also common. Copywriters have always strived to make their writing conversational. Why? Because one-to-one conversations are the most persuasive form of communications. They are direct and personal (even if they are mailed to thousands of people)."